The words explore the bomb-ravaged cavities of the buildings and use Gibran’s message of peace to stress human error. The message continues in the light diplomatic cadence of Newton’s narration and jets the story elsewhere. The nomadic wanderings of the film might at first create a sense of alienation. The Prophet certainly meanders, but not without purpose. The images Tarn selects might at first seem random. What relationship do the war-torn streets of the Middle East bear to a parade of naked bicyclists in England? If one listens attentively, however, one notices that Tarn uses the words of Gibran’s poem as a search for one’s place in the world. He takes the written word and finds images from around the globe to act as a visual equivalent. Spanning the story from America, to the UK, to India, Taiwan, and more, Tarn applies the poem to create a common thread between cultures. Stunningly shot by Tarn himself (he also did the music), The Prophet is a sincere and enlightening experience. It involves a high degree of sense-making, but the film evokes comparison to Chris Marker’s Sans Soleil through its powerful fusing of sight and sound. As with Sans Soleil, the globe-trotting nature of the film brings out the collective and humanist message of the text. Similar to the Chris Marker film, moreover, Tarn’s essay film will likely prove tedious to some viewers; consequently, the film is not recommended for moviegoers who dislike active viewing. On the other hand, moviegoers who like a film that makes them think will relish the beautifully evocative nature of The Prophet. It’s a compelling realization of love and loss. These films should really be discussed together, rather than separately. (The programmers in Canadian Spectrum are doing an excellent job of pairing shorts and features.) Both The Frog Princes and Petra’s Poem share stories of people with developmental disabilities who gain confidence by expressing themselves through the arts. 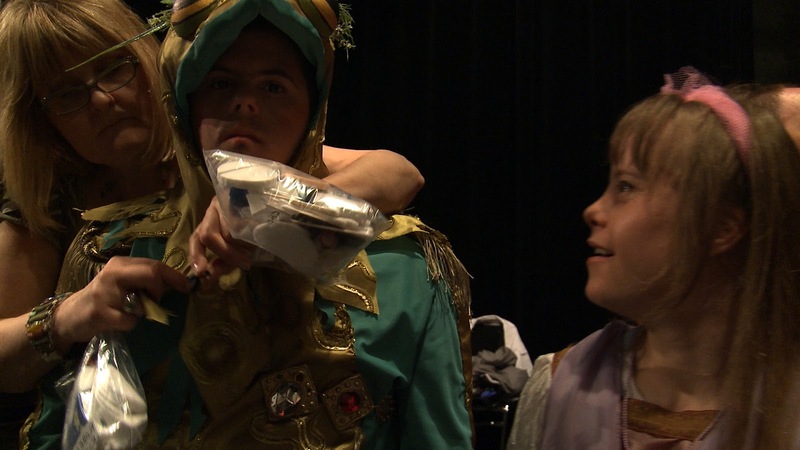 The Frog Princes documents the efforts of Dr. Stephen Snow at the Centre for the Arts in Human Development at Concordia University as he leads a group of students in preparing for a stage production of The Frog and the Princess. Dr. Snow uses drama as a therapeutic tool for helping students with developmental disabilities gain self-confidence through self-expression. He explains clearly how the process of learning a role helps develop other necessary skills. While The Frog Princes shows the development of a piece of art, Petra’s Poem uses the end product to celebrate the self-discovery afforded to the artist through her work. The film uses a poem written by Petra Tolley and allows Petra to recite the poem to camera. The film arranges Petra and her friends celebrating their individuality along with some animated visuals to express their anxieties and self-doubts. Both The Frog Princes and Petra’s Poem offer fair, even-handed stories of people finding themselves through art. Neither film patronizes its subject, nor do the films portray disability as a burden or something to be “overcome.” Instead, both films allow the subjects to come into themselves by engaging with their peers and their art. The observational style of The Frog Princes allows one to sit back and appreciate the work of Dr. Snow and his colleagues. It also focuses on two of the students, Ray-man and Tanya, and shows a remarkable character arc for both. The act of playing a role really lets the students discover who they are, which the film conveys by structuring the story in a series of acts akin to a play itself, with all the students joining together for a grand finale that sees the triumphant performance of their play. Petra’s Poem, on the other hand, offers a more collaborative approach to the Petra’s story and art by fusing form and content. The mixed choreography of Petra’s Poem allows Petra to tell her story in her own words, and uses the visuals only to assist when some things are too difficult to say. The Frog Princes and Petra’s Poem both celebrate the nurturing, liberating ability of artistic expression. The Frog Princes and Petra’s Poem screen again on Saturday, May 5th at the TIFF Bell Lightbox at 9:45 pm.